The Barrow ArcticDefinitions of the Arctic vary according to environmental, geographical, political, cultural and scientific perspectives. Some scientists define the Arctic as areas having a high latitude, long winters, short, cool summers,... More Research Center and Barrow Environmental Observatory are managed by UIC Science, a business unit of the Ukpeagvik Iñupiat Corporation. Barrow (c. 4000 inhabitants) is located at the northern tip of Alaska (USA) on the Arctic Coastal Plain north of the Brooks Range Mountains, at the junction of the Chukchi and Beaufort Seas. The adjacent Barrow Environmental Observatory comprises 30.21 km2 of tundraA type of ecosystem in which tree growth is limited by low temperatures. The origin of the word is from from the Kildin Sami word tūndâr, meaning "uplands" or "treeless mountain tract". In the northern... More, lakes, and wetlands reserved for scientific research including long-term environmental monitoring and habitat manipulation experiments. Barrow is characterised by a polar maritime climateThe average weather we would expect over a long period of time (seasons, years, decades). Climate varies from place-to-place across the Earth. Climate is determined by long-term (over at least... More but is semi-arid (c. 150 mm annual precipitation). It lies north of the tree-line so the dominant vegetation types are grass, moss and sedge. Virtually all land in the area is underlain by permafrostPermafrost is frozen ground that remains at or below zero degrees Celsius (32 degrees Fahrenheit) for two or more years. It forms in regions where the mean annual temperature is... More within a few meters of the surface. The landscape is characterised by thermokarstA landform that results when ground ice (ice-rich permafrost) melts. The melting leaves small, marshy hollows and hummocks in the land as the ground settles unevenly. See also thermokarst lake.... More lakes and drained lake basins undergoing plant succession. Polar bears and Arctic foxes are endemic to the region. A large number of transient bird species migrate to the North Slope during the summer including snowy owl, tundra swan, snow bunting, and various species of geese and ducks, including the endangered Steller’s and spectacled eiders. Caribou are frequently observed in the area. During the spring, bowhead whales migrate close to shore, and both gray and beluga whales are often sighted during the summer. Barrow has a long research history starting with the establishment of an observation station during the First International Polar Year (1882- 1883) – hosting near-continuous measurements since then. The Arctic Research Laboratory was established in 1947 and has supported a vast number of atmospheric, biological, oceanic, and terrestrial research activities. Present facilities include modern laboratories, storage, internet access, local accommodations, and cafeteria or self catering facilities. Vehicle support can also be arranged. Restaurants, supplies, and a grocery store are available in town. Several other programs funded through the US government maintain additional facilities in Barrow including the National Weather Service and Earth System Research Laboratory (both part of the National Oceanic and Atmospheric Admin. ), Atmospheric Radiation Measurement Climate Research Facility (Dept. of Energy), and the US Fish and Wildlife Service (Dept. of Interior). Additionally, the North Slope Borough Department of Wildlife Management is based in Barrow. Approximately 40 individual research projects are supported annually. Much of the work at Barrow involves atmospheric chemistryThe study of matter at the atomic and molecular scale.... More, ecosystemAll the living organisms (including people) in an area as well as its physical environment, functioning together as a unit. An ecosystem is made up of plants, animals, microorganisms, soil,... More dynamics, plant/animal phenologyThe study of the timing of recurring natural events such as bud opening, egg laying or the arrival of a migratory animal. Many living organisms have defined life cycle events... More studies, and Climate ChangeAccording to the United Nations Framework Convention on Climate Change, climate change is change in the climate of the whole Earth or a region of the Earth that is believed... More monitoring. Many sea ice studies are also based in the area. Limnological and large animal physiology projects are occasionally undertaken. Barrow has been occupied by humans for at least 1200 years, and a strong Inuit culture is still practiced today including subsistence hunting and whaling activities. English is the predominant language but many residents speak Iñupiaq. 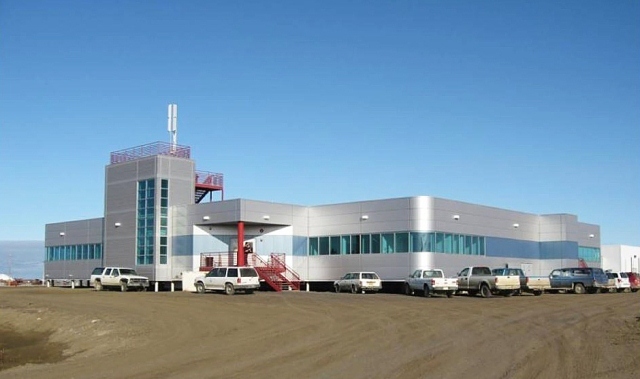 The village is the political, logistical, and administrative hub of the 245 000 km2 North Slope Borough, and as a result most modern conveniences are available. Summer tourism is an important part of the economy, and nearby resource extraction is becoming more prevalent. Several mobile phone carriers provide reliable service. Off -road access to the tundra (i.e. for hiking) requires a local land use permit. There are several gymnasiums open to the public and Barrow High School provides opportunities for spectator sports. Ilisagvik College provides continuing education and vocational training to students throughout the region.